We're thrilled to announce that we will be panelists at APAP this week in NYC. All registered attendees are welcome to join us. Please schedule an in-person meeting with Amelia and Thomas! It is an honor to announce that BANDALOOP will take part in Oakland's Inaugural Festival. Please join us! This celebration is FREE and open to the public. More information is availablehere. 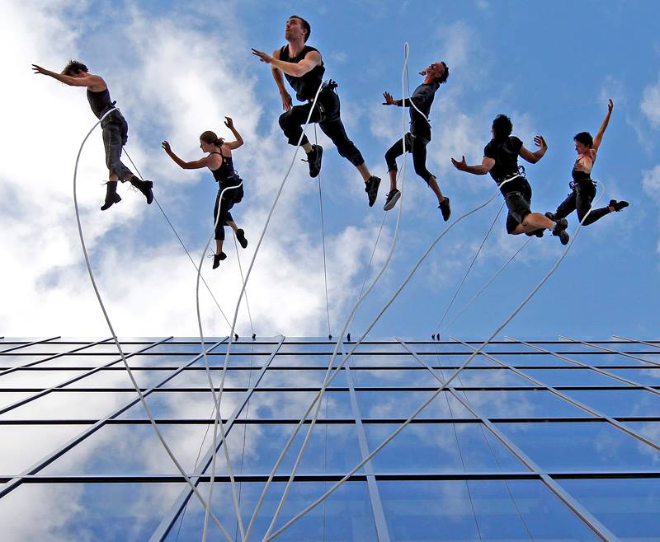 BANDALOOP is seeking one new company member for the 2015 season. Full company touring schedule is roughly 10-12 weeks over the year with local rehearsals before every tour. The ideal candidate is an experienced professional contemporary dancer with a background in climbing, aerial work or gymnastics. Must demonstrate excellent collaborative skills and the ability to adapt quickly to new situations. To reserve a space, send resume and link to video with AUDITION in the subject line tokrystal@bandaloop.org. For more information please email Krystal or call 269.876.1184. SPECIAL OFFER: While spaces are available for our Up The Walls Teen Workshop Jan 17-18, we are offering each registrant half off a second registration to bring a friend with them! Please send us an email for more information and to reserve. For information about our 2015 workshops including our Open Level Workshop in February, please visit our website.